Munchkin Munchies: Surprise Virtual Book Release Party for Sugarlicious~and Donut Cookies! Surprise Virtual Book Release Party for Sugarlicious~and Donut Cookies! Well, TODAY is the day! Meaghan Mountford's second book, Sugarlicious, is being released! My copy is actually in transit as I write:) Can't wait! Click HERE for the most charming book trailer ever! Meaghan is the creative genius behind the popular blog, The Decorated Cookie and the Edible Crafts editor at Craft Gossip (where she promotes and supports food bloggers)! Her blog offers such a wide variety of cute treats~all creative, and made doable by way of her own illustrations as step-by-step instructions. For the party, I wanted to make something of Meaghan's that I have had on my "to bake" list ever since I first saw them, almost two years ago~donut cookies! 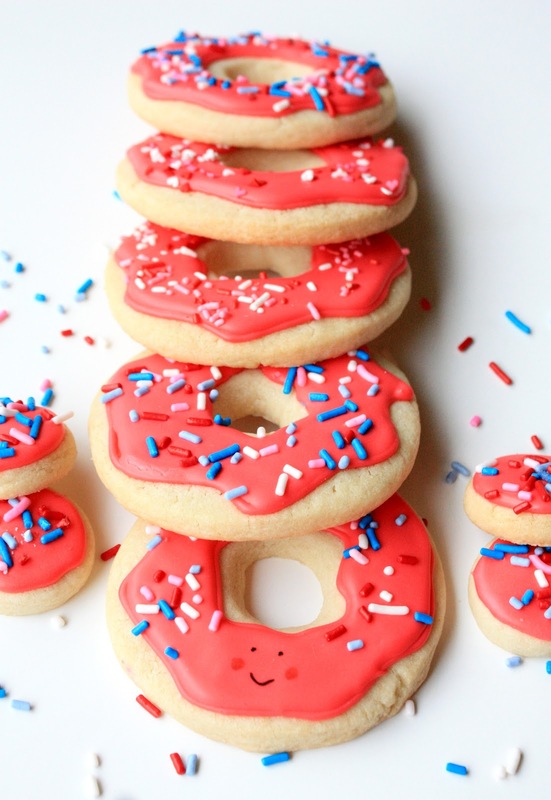 Her donut (doughnut) cookies are so darling, and pretty simple~my favorite combination! That's what I love about Meaghan and her blog; she has me believing that I can reproduce her creative treats, and I have, quite a few times:) You can too! As you can see, where there are donuts, ther are also donut holes. Instead of giving you my own instructions about how to whip up some sweet donut cookies, I'm going to link you to the original post at The Decorated Cookie blog, so that you can see for yourself what I'm talking about, with beautiful photography to boot! Take it away, Meaghan...click HERE for complete donut cookie instructions. I couln't resist bringing one of these donuts to life:) He's excited about Sugarlicious too! Best wishes, Meaghan, and MUCH SUCCESS with your fabulous new book! XO! To purchase a copy of Sugarlicious, click HERE! My goodness, these cookies are adorable! what a great idea, I love the colors and the little happy face on the last cookie. Thank you so much for all your help. Sue these are so darn cute!!! Look at that little face on the donut peaking out - how sweet. This has been so much fun - she was so happy and excited- just amazing!!! I'm going to be hunting down the UPS man looking for my book this week!!! Love your donut cookies (something I've never done and now want to try) and adding that adorable little smiling face peeking out at the bottom of the stack with his rosey cheeks is just too cute. These are so cute..love the little face! My Sugarlicious book is on it's way to me as well...YAY for Meaghan! 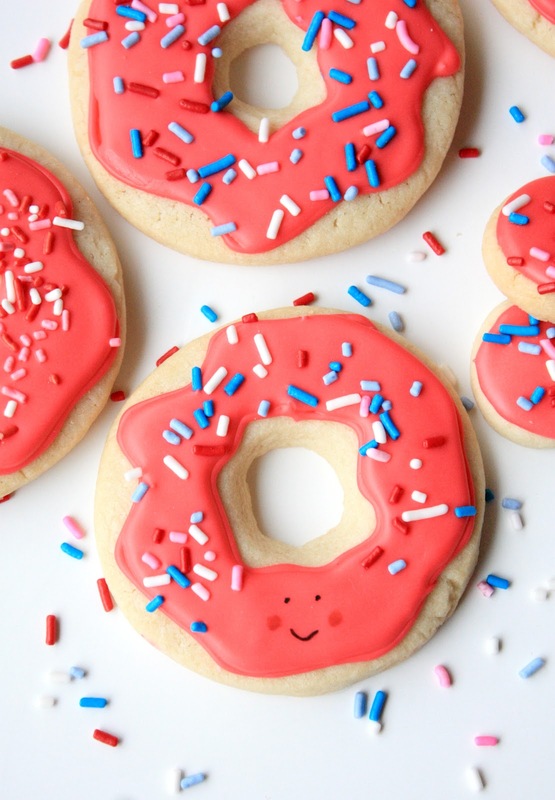 Those doughnut cookies are adorable, and look so VERY yummy! Seeing the little face made me chuckle. These are so cute. I am just on my tour around all the participants in this beautiful party! You have no idea how thrilled I am to be honored on YOUR blog! You lot of lovely ladies brought me such joy today. And lots of tears. Blogland has brought such a wonderful surprise in friendships! Those donut cookies are just the cutest! I can't wait till Meaghan's book arrives. It will be here Thursday!! Eeee! Yay!! I love the one with the smiley, such a creative touch. This party was so fun! I'm a big of Meaghan too! She is very creative and I loves all the cookies she made. I think you are as good as Meaghan too making these super-cute donuts cookies! These are super cute Sue! I love the colors too! I made donut cookies for Father's Day last year and hubby loved them. Thanks for sharing! Oh my... these cookies are so, so, suh-weet! These donut cookies are so fun! These donut cookies are adorable! You are so clever! Donut cookies! HeeHee! So cute! What a cutie patooti donut cookie. I'm waiting for my copy to arrive as well and looking forward to it. I've been so out of the blogging loop lately, I missed several of your posts, so I'm starting here. I know Meaghan (she sent Nick Malgieri to my blog last year to check out a tart I made from his cookbook..what a thrill! ), and those donut cookies look well, just like donuts! Congrats on the book, Meaghan!